Super simple Slow Cooker Apple Bread Pudding with Salted Caramel Drizzle is the perfect go-to dessert for fall. This recipe is so easy to make, tastes incredible, and fills your kitchen with the most amazing scents of cinnamon and spice! This is a sponsored post written by me in partnership of ALDI. All opinions are 100% mine. Are you ready for fall? It’s just my favorite time of the year. Fall is the best time for baking with apples, pumpkin, cinnamon and spices…all perfect ingredients for a yummy treat. 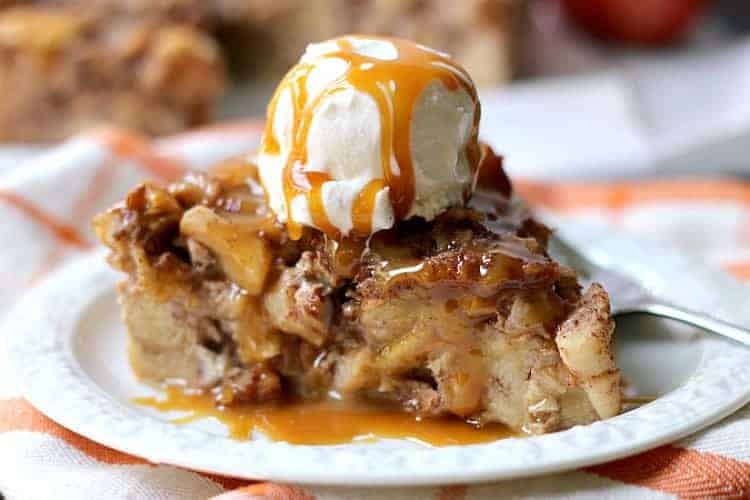 Now that apple season is in full swing, I wanted to share one of my favorite easy-to-make desserts – Slow Cooker Apple Bread Pudding with Salted Caramel Drizzle. This recipe is so easy to make and works for a dessert or even breakfast! When it’s time to buy ingredients for a recipe or simply do my weekly grocery shopping, my favorite place to go is ALDI. They offer a wide variety of products from organic produce, snacks and dairy items to USDA Choice meats, gluten-free options, baby items, beverages and more. I recently went through a bit of an ALDI withdrawal because our local store closed for a few weeks to renovate and expand. It was hard (honestly) but boy, it was worth the wait! The store is open now and airy, and the aisles are nice and wide making it so easy to walk around the store with kids in tow. They completely updated everything inside and out, and even expanded the building, adding 3 more aisles of products. 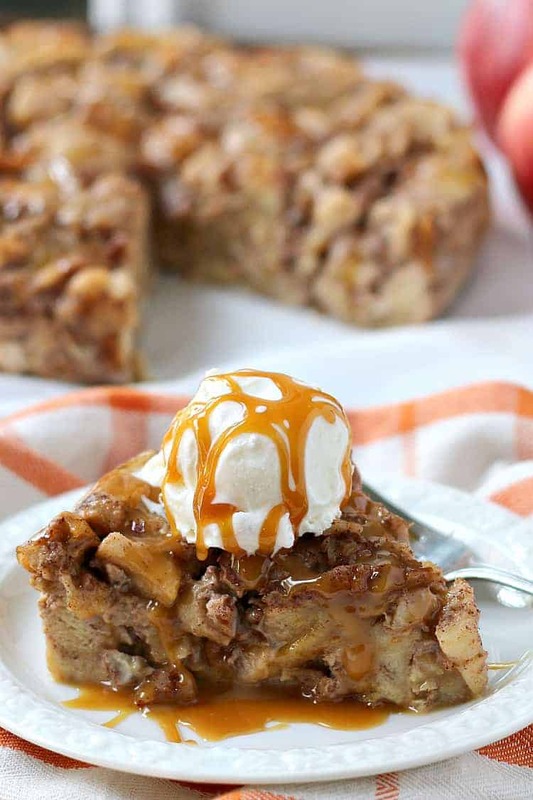 I had no doubt that they would have everything I needed to make this Slow Cooker Apple Bread Pudding. #ALDILove! This mouth-watering recipe starts with tender, sweet brioche bread. I found these delicious Specially Selected Brioche Buns at ALDI and they make the perfect base for this delicious dessert. 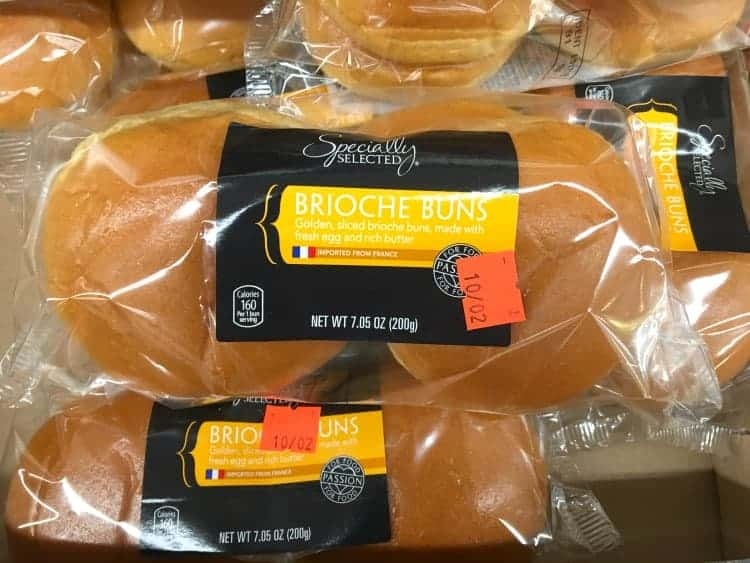 And it turns out, I’m not the only one loving these Specially Selected Brioche Buns because they recently won the 2017 Best New Product Award* in the bread category. Once you have your brioche buns cubed, it’s time to caramelize the apples. 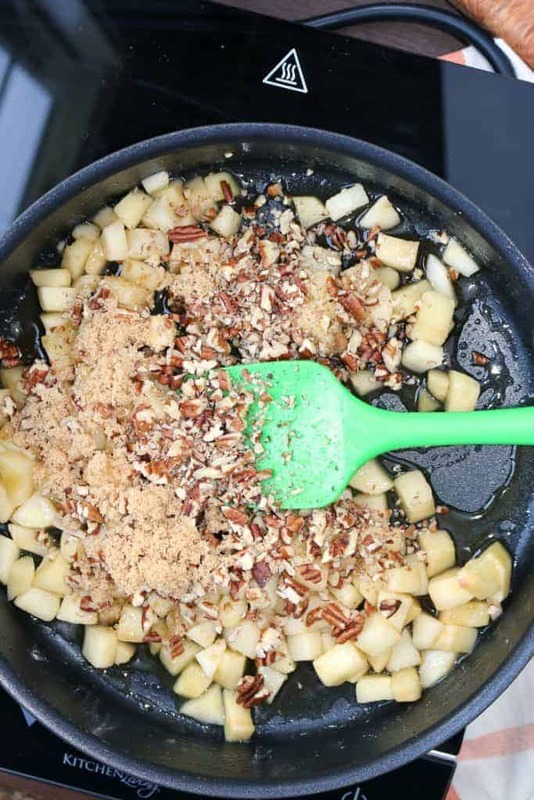 Put the diced apples in a skillet with some butter and cook over medium heat for about 3-5 minutes, just until the apples start to soften. Then add some chopped pecans (optional) and brown sugar and continue to cook for another minute or two. This creates an amazing glaze all over the apples. 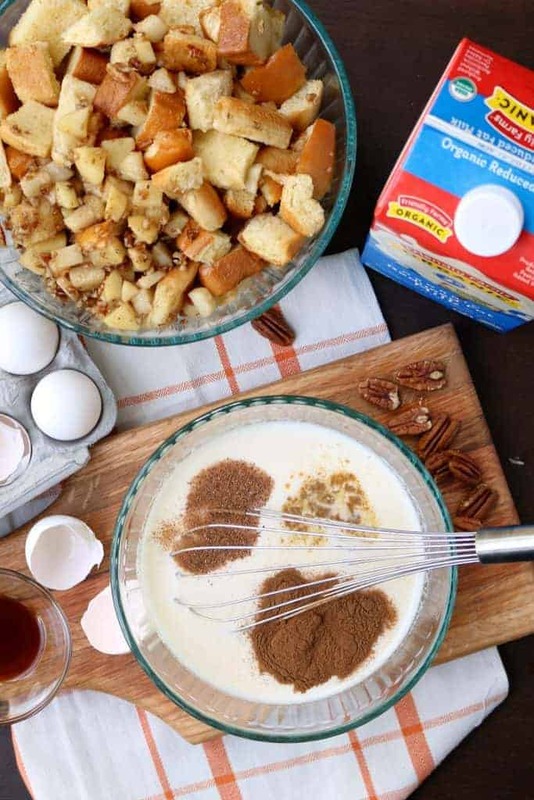 The creamy custard is a perfect blend of eggs, milk and spices like cinnamon, nutmeg and ginger that come together to create a bread pudding that is just bursting with fall flavor. 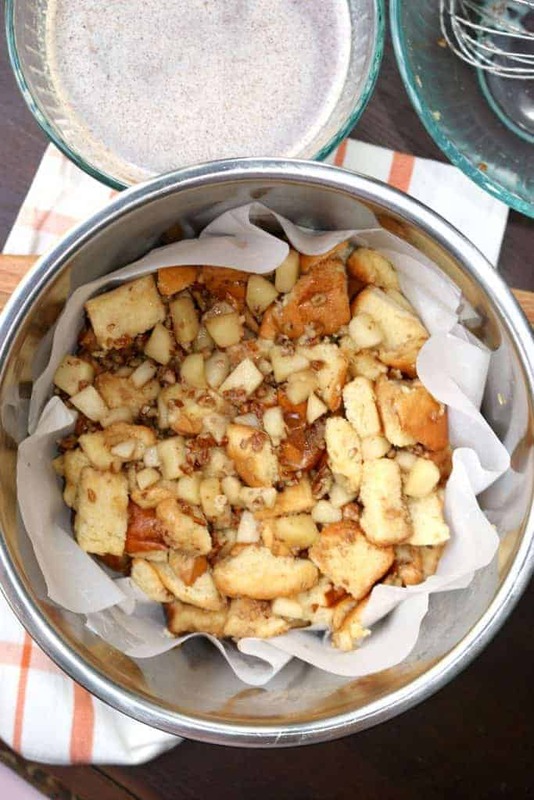 You can bake this Apple Brioche Bread Pudding in a slow cooker or even an electric pressure cooker using the slow cooker setting. Quick Tip: If you are using your pressure cooker for this recipe, set the temp setting to NORMAL instead of low. This seems to be the best equivalent to the low setting on a slow cooker. Whichever cooker you use, just remember to line the insert with parchment paper to help prevent any sticking. This bread pudding is done in no time. Just mix all the ingredients together, pour them into the lined cooker, and bake for 3-4 hours on LOW (or NORMAL) setting. Baked to perfection! To top things off, drizzle your bread pudding with salted caramel and serve with vanilla ice cream. 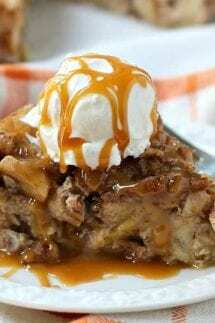 Slow Cooker Apple Bread Pudding makes a great dessert (or breakfast) for family gatherings or your holiday get-togethers. How delicious is this!?! 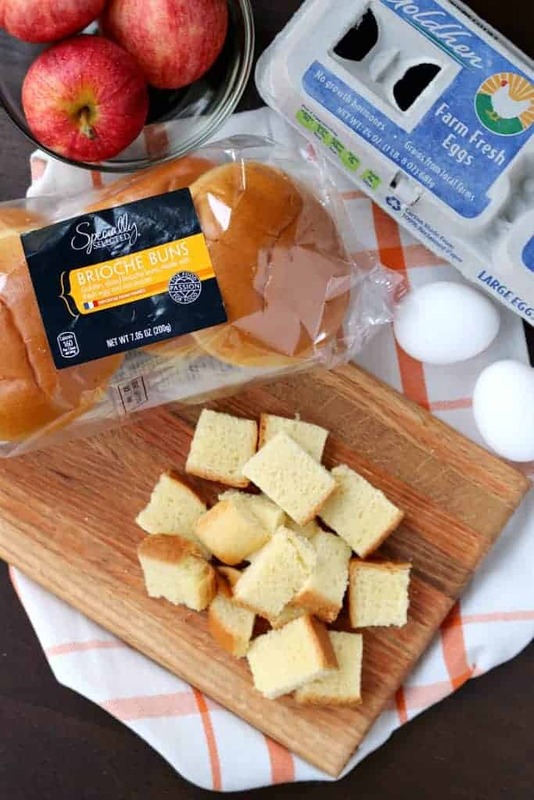 You might want to pick up some extra packs of Specially Selected Brioche Buns when you’re at ALDI because this bread pudding will be gone in a blink of an eye. 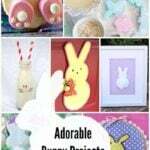 And while you’re there, be sure to check out some of the other amazing products they have available. ALDI takes such pride in what they put in their stores. All ALDI brand foods are free of certified synthetic colors, partially hydrogenated oils and added MSG, so you can feel good about the food you are buying for your family. 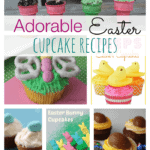 And the icing on the cake…all of these products are available at year-round affordable prices. It’s a win-win! I hope you enjoy the recipe and be sure to check out your local neighborhood ALDI and see all the amazing things they have to offer! *Results based on the 2017 BrandSpark Best New Product Awards survey and real user feedback from Shopper Army. Looking for more Slow Cooker Desserts? Cut Specially Selected Brioche Buns into 1” cubes. Place in large bowl and set aside. Place butter in skillet over medium heat. Once melted, add chopped apples and cook for 3-5 minutes until apples are tender, stir occasionally. Add brown sugar and pecans (if using) and continue to stir over medium heat for another 1-2 minutes. Remove from heat and let cool. In a separate bowl, whisk together eggs, milk, granulated sugar, cinnamon, nutmeg, ginger and salt. Pour caramelized apples over brioche bun cubes and toss until apples are well incorporated. Spoon brioche and apple mixture into parchment paper lined slow cooker insert (or electric pressure cooker insert). Pour egg custard all over the bread and apple mixture. If the bread and apple mixture isn’t completely submerged in egg custard, lightly compact the bread apple mixture until completely covered by liquid. Cover and cook on LOW for 3-4 hours. Cover and cook on NORMAL if using the slow cooker setting on an electric pressure cooker. Uncover and let sit for 5-10 minutes before removing from cooker. Remove from cooker and drizzle salted caramel over top. Serve warm with vanilla ice cream or powdered sugar. This is a sponsored post written by me on behalf of ALDI. All opinions are 100% mine. Can this be converted to the instapot? I want to do this with different bread. How many cups of bread cubes do the buns produce?